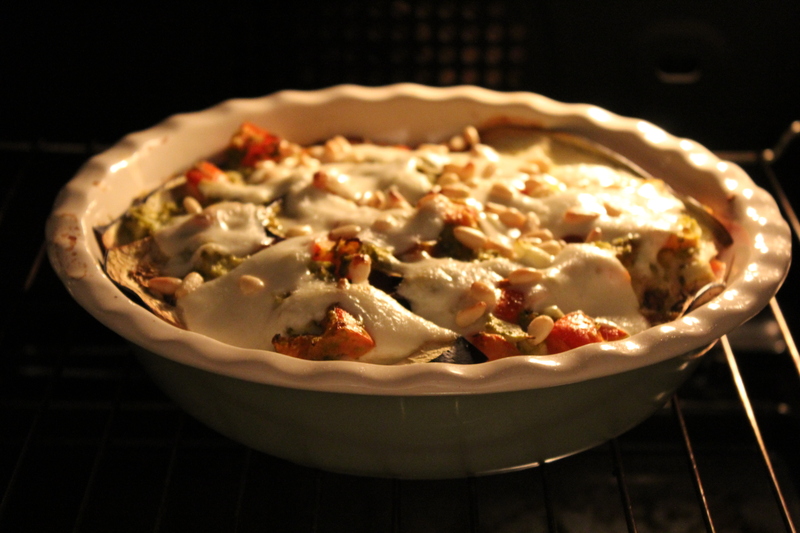 Aubergine and Pesto Bake first appeared on the blog in 2011. It’s one of those recipes that is ideal for a student – simple, packed full of flavour and cheap to make, this vegetable bake was cooked almost weekly. But three whole years have passed since I first shared this post. A lot of things have changed. I’m no longer a student but a working woman in London. I don’t cook for one, but instead for two. 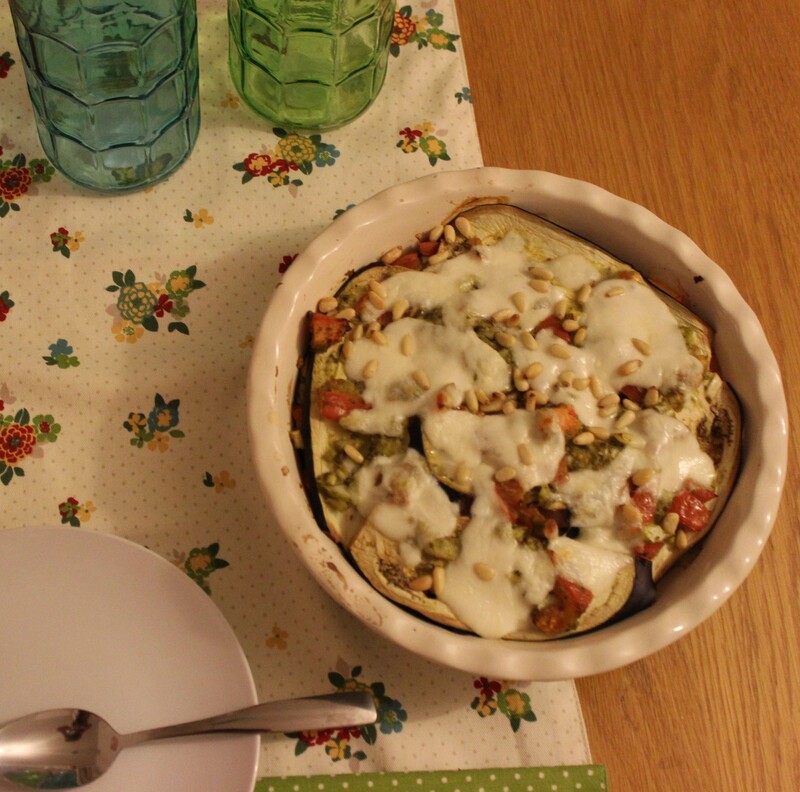 But as Jon is a vegetarian (and a big fan of pesto) Aubergine and Pesto Bake is still a go to recipe…it’s just had a bit of a make-over. Re-posting an old recipe just felt right. I’ve been doing a lot of self-reflection lately because to be honest last six months have been incredibly hard and I’m looking forward to moving on to the next chapter in my career. When I move to the next department in a few weeks time I’m going to make a conscious effort to spend a bit more time on me. My job will always be demanding, and I try incredibly hard to make sure my friends and family don’t suffer, but it would seem I have suffered in the process. As a way of reconnecting with what I love, I’ve bought myself a DSLR. The plan is to take pictures of the things that make me happy – people, food and nature. On Sunday I’m going to post the first in a series called “Snapshots from my week.” Every Sunday I’m going to share with you the ups and downs of my week in pictures. I’m also going to be trying to get back in the kitchen. To take the pressure off I’ve decided to reflect on some past posts – just like this one! So you can expect more make-overs of previous recipes. That means they’ll be bigger and better than before! For those of you who didn’t get to see this recipe first time round it used many of the same ingredients. This time however I’ve replaced sliced tomato with finely diced along with garlic, onion and pesto. Layering this between the thinly sliced aubergine means the pesto bake resembles a lasagne more closely. No longer being a student, I’ve also begun topping the bake with pine nuts. Even on my salary I’m shocked by just how expensive pine nuts are but her – they taste good, add much needed texture and make the bake look pretty so if you can afford it don’t scrimp! I’ll let you in on a secret though – I still serve this alongside the same old garlic bread. Some things never change do they…. Slice the aubergine thinly lengthways to create large, flat slices of aubergine. Place to one side. Dice the tomatoes and place in a bowl with finely chopped onion, crushed garlic and the pesto. Stir until fully combined. 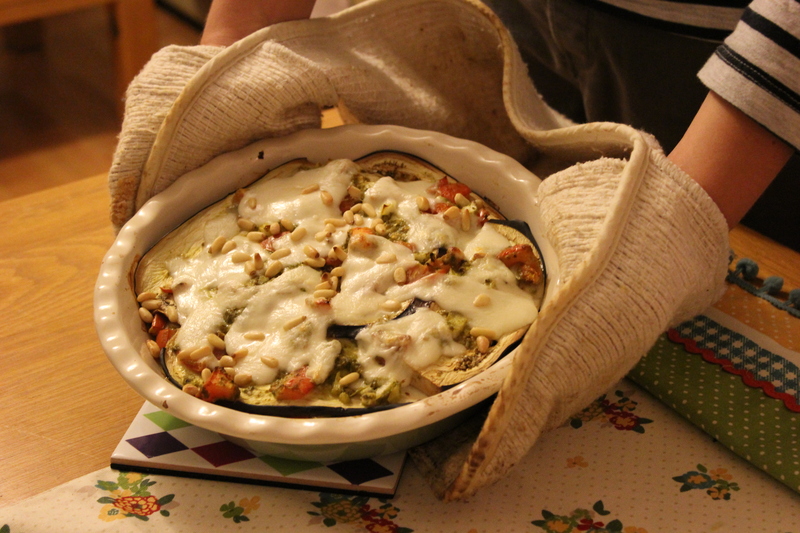 Place a layer of the aubergine into the bottom of an oven proof dish and top with a third of the tomato and pesto mix. top with another layer of aubergine and repeat. Much like you do when you’re building a lasagne. Leaving the mozzarella and pine nuts to one side. Cook the layered vegetable bake in the centre of oven for 20mins or until the tomato mix has become to break down and the aubergine slices soften. After the 20mins is up, top with the slices of mozzarella. Bake in the centre of the oven for another 10 mins. In the final 5 minutes top with the pine nuts. Service piping hot with green salad, garlic bread or cous cous. Reblogged this on Supper in the Suburbs. Goodfoodmarsh, aubergine is one of my favourite veggies!! !